The ICC is excited to announce more of its exciting festival performers! 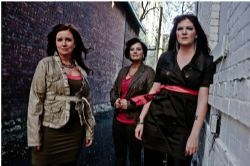 On Saturday night, we have the hugely talented sister group Searson, comprised of Erin, Heather and Colleen Searson. These three multi-talented sisters play a variety of instruments and are all expert step dancers. Piano, organ, fiddle, tenor guitar and bass are all highlighted in their live performances. Talented drummer Danno O'Shea is an energetic compliment to the live show. Searson incorporates a mix of Celtic and Pop music while effortlessly incorporating Ottawa Valley style fiddling into their live shows. Other notable acts include local favorites Erin’s Guild, with their signature high-energy performances of traditional Irish ballads and folk songs, and the Auld Locals, whose recent performances include opening for the Saw Doctors at the House of Blues this past St. Patrick’s Day. If you’d like to hear some traditional instrumental Irish music, then local acts Corvus and The Ivy Leaf will be here to play jigs and reels to your heart’s content. Comprised of Emily Peterson, Sean Smith, and Steve Levy, Corvus are an experienced trio of traditional musicians well known in the Boston area. The Ivy Leaf is a young traditional group from Boston featuring a mix of Irish bouzouki, fiddle, flute, tin whistle, and vocals. The Rhode-Island based Tom Lanigan Band returns to the stage this year, with their unique take on traditional and contemporary Irish music and an ever-growing collection of original compositions. Also returning is family group The Rebel Kellys, featuring parents Adam and Jessi, as well as 7-year-old Yeshuae on percussion and vocals and 5-year-old sister Evelyn on percussion, vocals, and dancing feet. Whether you are a fan of traditional, contemporary, ballads, or instrumental Irish music, this year’s Boston Irish Festival has a little something for everyone. Stay tunes for a spotlight on more acts to come, and make sure you head over to the festival on June 7, 8, & 9 to catch some of this great talent!